Promotion hopefuls Aston Villa recorded their sixth successive league win at the expense of lowly Burton Albion. The hosts took the lead when Scott Hogan tapped in after good work from Robert Snodgrass and Albert Adomah. Adomah made it 2-0 after being played in by Snodgrass, but Ahmed Elmohamady put the ball in his own net to give the Brewers hope. Jack Grealish put Villa back in control before debutant Liam Boyce's late consolation for Burton. 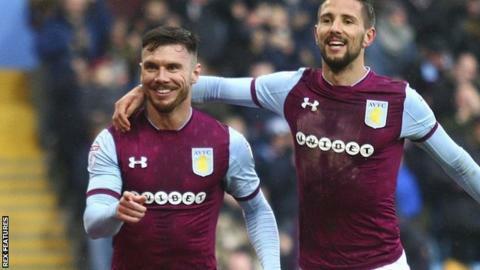 It is the first time third-placed Villa have won six games in a row since 1990, but Derby's home victory over Brentford meant they remain a point off second place. After an even opening Steve Bruce's side took the lead when in-form striker Hogan scored his eighth of the season and top scorer Adomah looked to have made it comfortable when he added the second after the break. However, the bottom-placed Brewers kept battling and Elmohamady's own goal put them back in it and, despite Grealish's volley, they set up a tense finish when Boyce scored in time added on. It was not enough for Nigel Clough's side, though, and they remain three points adrift of safety. "We are very happy with the win although we were a little nervy near the end. "We conceded a couple of strange goals which is unusual for Villa and hopefully it will not occur again. "We got nervy when there was only one goal in it and you need your experienced players, who rose to the occasion." "Given our present circumstances I do not think the team could have done any better, I think it was a brilliant performance. "What we will try to do for the next 16 games is to play as we did against Villa. "We will try and play with a smile on our face even if we are bottom of the league." Match ends, Aston Villa 3, Burton Albion 2. Second Half ends, Aston Villa 3, Burton Albion 2. Goal! Aston Villa 3, Burton Albion 2. Liam Boyce (Burton Albion) right footed shot from the centre of the box to the bottom left corner. Assisted by John Brayford with a through ball. Corner, Burton Albion. Conceded by John Terry. Goal! Aston Villa 3, Burton Albion 1. Jack Grealish (Aston Villa) right footed shot from the centre of the box to the bottom right corner. Assisted by Ahmed El Mohamady with a cross. Substitution, Aston Villa. Mile Jedinak replaces Conor Hourihane. Offside, Aston Villa. Jack Grealish tries a through ball, but Scott Hogan is caught offside. Corner, Burton Albion. Conceded by James Chester. Foul by Josh Onomah (Aston Villa). Birkir Bjarnason (Aston Villa) wins a free kick in the defensive half. Jack Grealish (Aston Villa) hits the bar with a right footed shot from outside the box. Assisted by Conor Hourihane following a corner. Corner, Aston Villa. Conceded by Marvin Sordell. Ahmed El Mohamady (Aston Villa) is shown the yellow card for a bad foul. Foul by Ahmed El Mohamady (Aston Villa). John Brayford (Burton Albion) wins a free kick in the defensive half. Substitution, Burton Albion. Liam Boyce replaces Ben Turner because of an injury. Delay in match Ben Turner (Burton Albion) because of an injury. Own Goal by Ahmed El Mohamady, Aston Villa. Aston Villa 2, Burton Albion 1. Attempt saved. Lucas Akins (Burton Albion) right footed shot from the left side of the six yard box is saved in the top left corner. Assisted by Ben Turner. Attempt blocked. Ben Turner (Burton Albion) header from the centre of the box is blocked. Assisted by Lloyd Dyer with a cross. Jack Grealish (Aston Villa) is shown the yellow card. Jack Grealish (Aston Villa) has gone down, but that's a dive. Substitution, Aston Villa. Josh Onomah replaces Albert Adomah. Substitution, Aston Villa. Axel Tuanzebe replaces Robert Snodgrass. Goal! Aston Villa 2, Burton Albion 0. Albert Adomah (Aston Villa) header from the left side of the six yard box to the bottom left corner. Assisted by Robert Snodgrass with a cross. Offside, Aston Villa. John Terry tries a through ball, but Albert Adomah is caught offside.